April 17, 2017 – This week, our time machine attends the Gilded Age performances of a man who heralded the Borscht Belt, Vaudeville, and paved the way for performers from Mel Brooks to Barbra Streisand and Jerry Seinfeld. He did so by performing Jewish characters — for the first time — with dignity, humor, and emotional depth. Born in 1849, M.B. 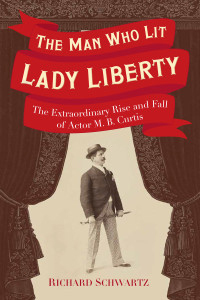 Curtis gained worldwide fame — and as an immigrant himself, reached into his own pocket to illuminate the Statue of Liberty when the U.S. government wouldn’t foot the bill. Our guide on this journey is Richard Schwartz, author of the previous works Earthquake Exodus, 1906; Eccentrics, Heroes, and Cutthroats of Old Berkeley; The Circle of Stones: An Investigation of the Circle of Stones in Stampede Valley, Sierra County, and, Berkeley 1900. Thanks to singer-songwriter Val Hovik for supplying the original song Liberty Shine off his Listen to Me Now Album. If you dig the tune, pick up the single or the Album on Amazon, visit ValHovik.com.